The Dividend Aristocrats, as you may well know, are companies that have increased their annual dividends without interruption for at least 25 years. That speaks to a high level of dependability and stability that even many other blue chips can’t claim. But boy, can they be stingy. 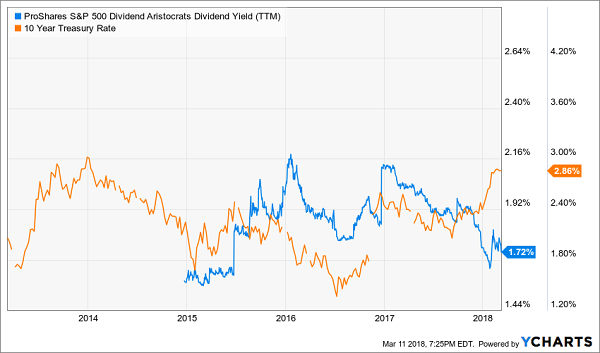 The ProShares S&P 500 Dividend Aristocrats ETF (NOBL), which faithfully tracks those payout champions that call the S&P 500 index home, collectively yields 1.7% at the moment, which is an almost laughable amount of current yield. The 10-year Treasury isn’t just beating that – at a roughly 2.9% yield, it’s simply clobbering it. Yes, Dividend Aristocrats will grow their payouts over time, so your yield on cost on NOBL eventually will be much better than that. Not to mention, some Dividend Aristocrats yield far more than the 1.7% average. But if you’re going after dividend royalty, it pays to buy in when they’re a little more generous than they typically have been. The following is a look at five Dividend Aristocrats that currently are yielding more than they have been for all or most of the past half-decade. But an important note: A little extra cash at the moment doesn’t necessarily make them all buys – in some cases, their yield is a sign of weakness, which itself is a warning sign. Let’s sort the deals from the duds. Target (TGT) has been on the comeback trail of late, ripping off 14% gains over the past three months, even with a bit of a pullback more recently. That’s because the retailer poured $7 billion into a multiyear project that seemingly has paid dividends, with the company reporting in January that its holiday comparable-store sales grew 3.4% to clobber Wall Street’s expectations. But we found out in early March that while Target’s fourth-quarter top-line and comps growth was impressive, it came at a dear price. 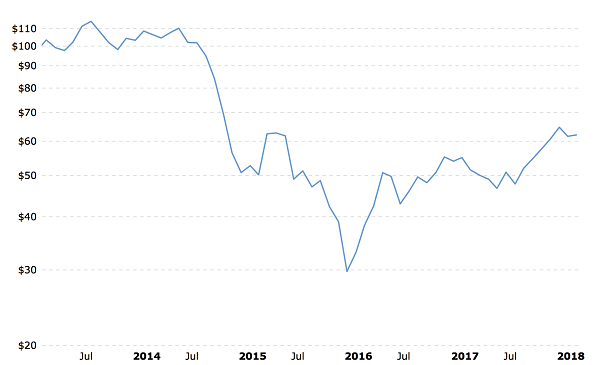 EBIT margins dropped by 1.4 percentage points, and earnings fell 6% for the full year – a year that benefited from an extra week, no less. Quo Vadis analysts also point out that the continued investment will pressure margins, as will higher labor costs. That’s the rub with Target, too. It has these margin issues, and that’s without being willing to cut as deep into prices as Amazon.com (AMZN) and Walmart (WMT). Also, Target continues to lose a big advantage it once held over Walmart; that is, as more people look to e-commerce rather than visiting physical stores, Target’s somewhat nicer aesthetic is no longer the difference-maker it once was. Walmart’s partnership with Lord & Taylor also may help it vault into a higher-earning demographic, cutting further into another Target edge. 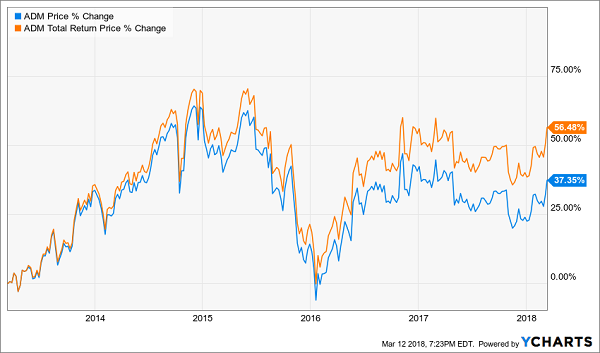 TGT is yielding 3.5%, which is much more than it has paid during most of the publicly traded life, though it’s certainly less than the 4%-plus yield it delivered for about six months of last year. 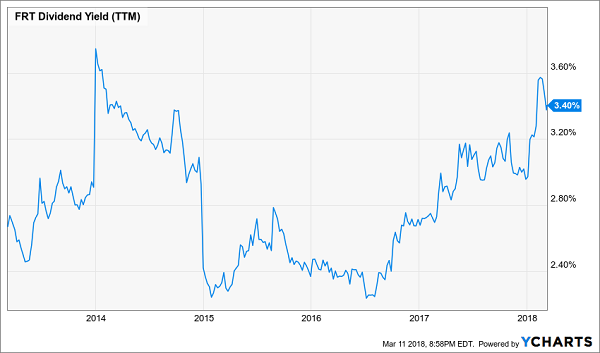 Thus, while the dividend is elevated, and the retailer’s prospects certainly look better than they once did, neither aspect of Target looks great right now. There are better opportunities to pursue. Retail is indeed a dangerous playground. Amazon deserves most of the credit for making e-commerce such a high-growth threat to the industry, but at this point, it’s also human taste. There’s a reason why retailers as big as Walmart to as niche as Williams-Sonoma (WSM) have gone all in on their online operations – more people simply don’t want to go to the mall anymore, when given the choice to stay home and order in their undies. This has weighed not just on retailers, then, but also the real estate investment trusts (REITs) that deal in retail property. After all, when tenants go out of business, and when there are few new tenants that want to step into their place, these are the companies that suffer. Thus, as a general rule, it makes sense to stay away from retail REITs as this new normal sets in. Federal REIT (FRT) may be an exception. It sounds like the kind of company that should be suffering – after all, it invests in retail real estate in 12 states and the District of Columbia. It at least has an edge in that its properties tend to be higher-quality in nature, and in extremely large markets. That hasn’t stopped Wall Street from selling FRT shares off by more than 30% in the past year and a half – all while the S&P 500 has shot 25% higher. But Wall Street might be selling the narrative, not reality. Just last month, Federal REIT announced that funds from operations (FFO, that important metric of REIT performance) actually grew to $5.74 per share in 2017 from $5.65 in the prior year, on same-center property operating income that grew 3.4% year-over-year. Better still, FFO guidance for 2018 came in a range of $6.08 to $6.24, which at the midpoint would represent 7% growth. The company isn’t even paying out 70% of its funds from operations as dividends, and that payout has been expanding for a half-century without interruption. Moreover, the yield has bubbled up to 3.4% – not high, but near multiyear peaks for FRT. While I know retail REITs aren’t the safest bet on Wall Street, FRT is practically begging for a chance to prove itself to investors. We’ll talk about one last retail-related company, VF Corp (VFC), and I find this one fascinating because it’s nothing like either of the companies we’ve mentioned before, nor other traditional retailers. That’s mostly because it’s not actually a retailer. Kind of. Let me explain. VF Corp is actually an apparel and footwear company that produces goods under well-known brands such as Wrangler, The North Face, Timberland and Vans. These brands are well-known because you’ve seen them in more than one store – they’re peddled at numerous mall retailers such as JCPenney (JCP), Macy’s (M) and Sears (SHLD). Shares look rich at 48 times trailing earnings, but at least somewhat more reasonable at 21 times earnings estimates. Indeed, the company’s fourth-quarter was a boffo event that included upgraded 2018 guidance, and Wall Street even expects double-digit profit growth next year. VF Corp also accomplished a few other things, such as trimming off its Majestic and JanSport brands, and even reinvesting roughly $100 million back into the business. While VFC’s 2.4% yield isn’t high, and while it was slightly loftier about a year ago, it’s still delivering more income than at most points over the past half-decade. VF Corp, while still in a difficult industry, appears to be getting its act back together. However, I might wait for a slightly lower price. Archer Daniels Midland (ADM) might be one of the more boring Dividend Aristocrats, but its businesses – including crop procurement and transportation, ingredient manufacturing, farmer services and even commodity trading – are one of the most important in the world. ADM at a glance might look like a sticky wicket given the situation surrounding a potential buyout of rival Bunge. Reports from a couple months ago had Archer Daniels Midland taking interest in Bunge in January, then said the two were actually in talks in February, but more recently, JPMorgan analysts said they weren’t enthusiastic about the economics of any deal, and shortly thereafter talks reportedly broke down. That’s not a reason to avoid ADM, which at a roughly 3% yield is delivering much more income than it has averaged over the past five years. Goldman Sachs’ Adam Samuelson recently upgraded Archer Daniels Midland to “Buy,” with a $50 price target no less, just a week after Citigroup analysts brought its own rating up a notch. Among the tailwinds are ethanol and corn processing, as well as the company’s Ag Services segment. Wall Street already expects a 17% jump in profits this year, so if ADM can deliver the goods, it will be in a good position indeed. The last time Exxon Mobil (XOM) yielded this much was momentarily during the oil plunge of 2014-2016, but before that, you had to go all the way back to the mid-‘90s to claw this much income out of the integrated energy giant. Yet, something is very different now than just a couple of years ago. Namely, oil has rebounded in value – and while it’s still nowhere near triple digits, at $60 per barrel, the energy industry finally has room to breathe again. So what gives with XOM? Exxon Mobil has strung together a number of disappointing results, including a fourth-quarter profit of 88 cents that fell 15% shy of analyst estimates. That came on a well-less-than-expected top line of $66.5 billion. In fairness, XOM’s full-year profits were the best it has posted since 2014, but Wall Street wanted so much more. Unfortunately, investments by former CEO Rex Tillerson simply haven’t borne as much fruit as hoped for, including a $31 billion purchase of XTO Energy that has yet to pay off, breeding skepticism. The company’s recently unveiled plans to more than double earnings by 2025 were met with sneers, and Exxon even had to scrap some joint ventures with Russia’s Rosneft because of American sanctions. It almost seems silly to pass on Exxon when it’s yielding this much, but the road could remain difficult in the short-term. Exercise extreme patience, and only strike if prices become even more depressed, or if Exxon Mobil starts to show progress on its grand seven-year growth plan. Let’s be honest: The 2% to 3% dividend yields in most of the stocks get little respect from most folks. After all, even a little good news could send the stock price more than 2.6% higher in a single day! But when you look long-term, you can quickly see how even a low yield can make a huge difference to your overall return — but only when you add dividend growth. Dividend Growth Drives a 51% Bigger Return! Dividend growth like that — and even faster — is precisely what’s behind the portfolio I want to show you now: it’s a set of 7 ultra-conservative stocks I handpicked to hand you 12% in safe, annual returns for life. Because that’s more than enough to double your portfolio in 6 years and give you 3 times more income than experts say you need in retirement. What stocks am I talking about here? You’re not going to find companies backed only by big brand names (I’m looking at you, GE and Coke) in my “12% for Life” portfolio. And you won’t find so-called “safe” but slow-growth pundit favorites like Exxon Mobil or Verizon, either. 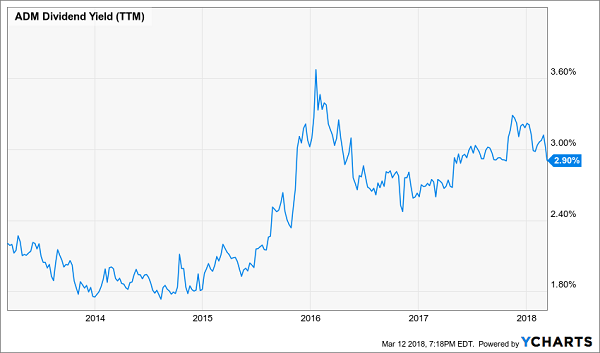 A stock that has already boosted its dividend payments more than 800% over the past four years, and has at least another decade of double-digit growth left in the tank! A 9%-plus payer that raises its dividend more than once a year, and will double its payout by 2021 at its current pace! This portfolio is retirement catnip because it provides the best aspects of numerous types of investment strategies—income, growth and even nest-egg protection! Let me show you the way to double-digit returns that you can actually depend on. Click here and I’ll GIVE you 3 Special Reports that show you how to earn 12% for life. You’ll receive the names, tickers, buy prices and my complete analysis of these 7 stout dividend growers absolutely FREE!